Fry-Up Bowl – An Easy Meal For Anytime! Fry-Up Bowls are a favourite easy meal in our house. To be honest they are not always 100% fried, and the ingredients often change, but they are always served in a bowl, so that’s something consistent I guess. We eat this kind of food when a decent breakfast is called for. But it also works well for lunch and dinner, and is a fabulous way of using left-overs. In fact I often cook more food than can be eaten in one meal just so that I have left-overs to use at another. Don’t you? Also, those potatoes? Totally worthy of being cooked ON THEIR OWN for immediate consumption when comfort food is called for or when the football is on! Protein – This could be eggs; cold cooked meat from a previous meal; sausages, bacon, or any other meat that suits a quick fry-up. Fermented Vegetables and a dab of butter to finish. *Use variations of any of the above based on what you have to hand. So, start with some boiled and well-drained or cold potatoes. Turn your oven up to HIGH and get out a heavy baking dish. Pour a good slug of oil into the pan and rub it around with your fingers to coat the bottom. Dump your cooked potato pieces into the oiled pan and then squash them down with your hand, the back of a spoon or a potato masher – whatever is closest. The potatoes will flatten and break up. Great! Now drizzle more oil over them and sprinkle with salt and a bit of herb (fresh or dried rosemary or oregano is good) and chuck them in the hot oven. Turn after ten minutes and cook again for another ten. You’ll end up with nice hot crispy potatoes that are still fluffy and soft in the middle. While the spuds are baking put some hot water into a saucepan and bring to the boil (only do this if you aren’t frying everything – but know that frying everything is an option…) and get your frypan on. Add a little fat/oil to the frypan and then add any meat you are going to cook up or reheat. Fry-up – your sausages, bacon or cold leftover meat will be well on its way to cooked or hot. Now you can add tomato, onion, mushroom, an egg or whatever else takes your fancy – or any vegetables that are pre-cooked and which need reheating. Turn occasionally to prevent sticking and allow even cooking. Place some potato in bottom of bowl. Add some cooked vegetables and whatever you’ve fried up. Dab that butter on if you’re a butter kind of person. (Hint – pre-slicing cooked sausages or other meat makes eating it a whole lot better!) Add any salad items or chopped fresh herbs to the top, and a spoonful or two of fermented vegetables like kimchi or sauerkraut. Salt and pepper if you want. Eat! Yummy Sweet Treats for You! Nicole is in bed today feeling sick. So I made her take a break and prepared this blog post for you. I hope you enjoy our top 5 yummy treats from Cauldrons and Cupcakes! “Each time I make this I think of my Nana and her friends, sitting drinking cups of tea, eating slice and chatting during the long days of the War, with the rations and limitations and hardships. 4. Walnut and Dark Chocolate Coconut Bites – Fit for a Prince! We hope you enjoy looking at this and most of all cooking and eating these yummy treats! Nicole sends her love! 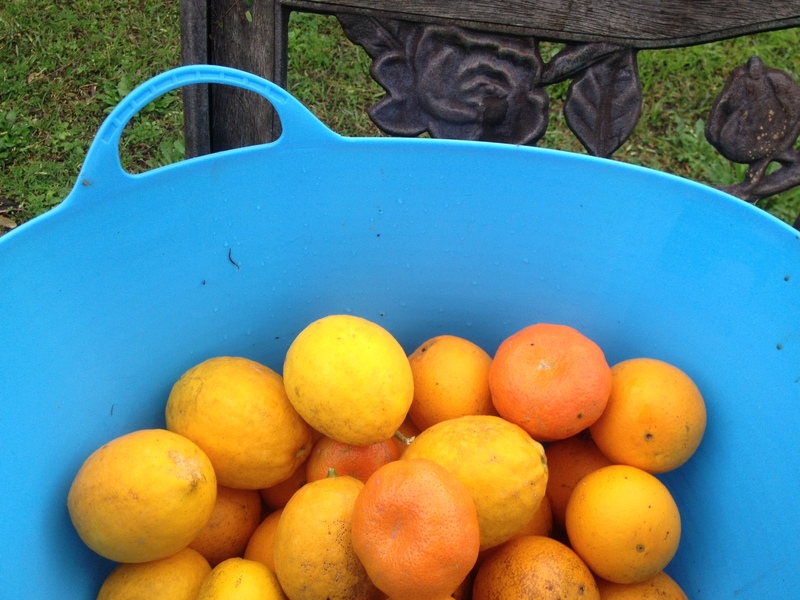 The orchard at our farm is laden with citrus at this time of year, so whipping up a tasty salad is easier than ever. This salad is perfect with crusty bread, and can be a vegetarian meal on its own (vegan if we omit the feta) or a perfect side for a barbeque or roast. It goes beautifully with grilled fish or chicken. 4 cups of salad leaves (using rocket, mustard greens, radish tops or other leaves with a little bite to them contrasts well with the oranges), a fennel bulb or two, a bunch of fresh chard if available (or add in two cups of baby spinach), one small red onion, two large oranges cut into segments (if you’re mad on oranges feel free to add another one! 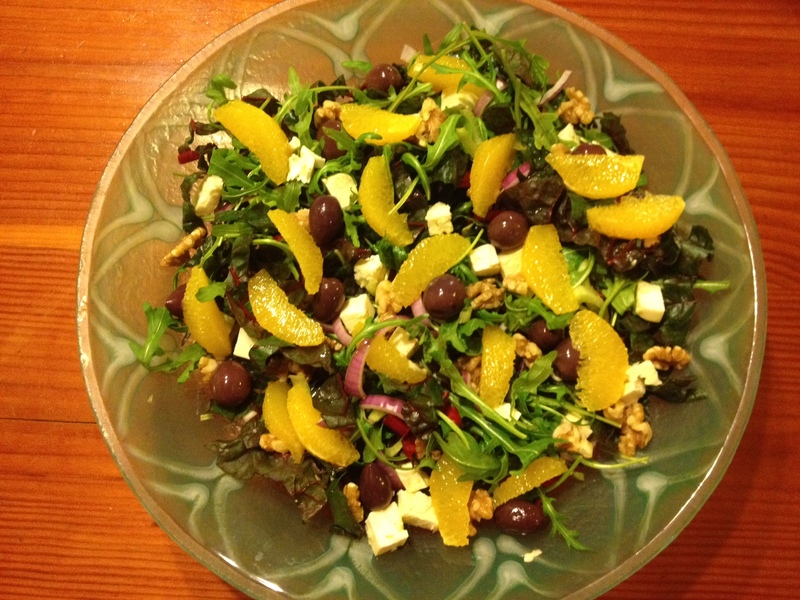 ), a generous handful of walnuts, 1/2 a cup of olives, optional – 1 cup of feta cheese chunks. 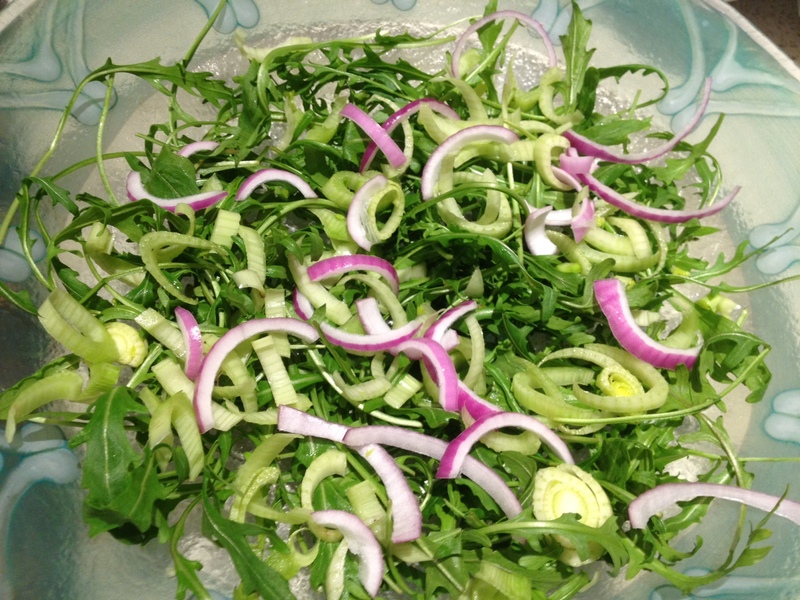 Clean and wash your salad greens, and tear leaves into smaller pieces if desired. Finely chop the fennel. Slice your onion into thin rings or pieces and arrange in the serving bowl. 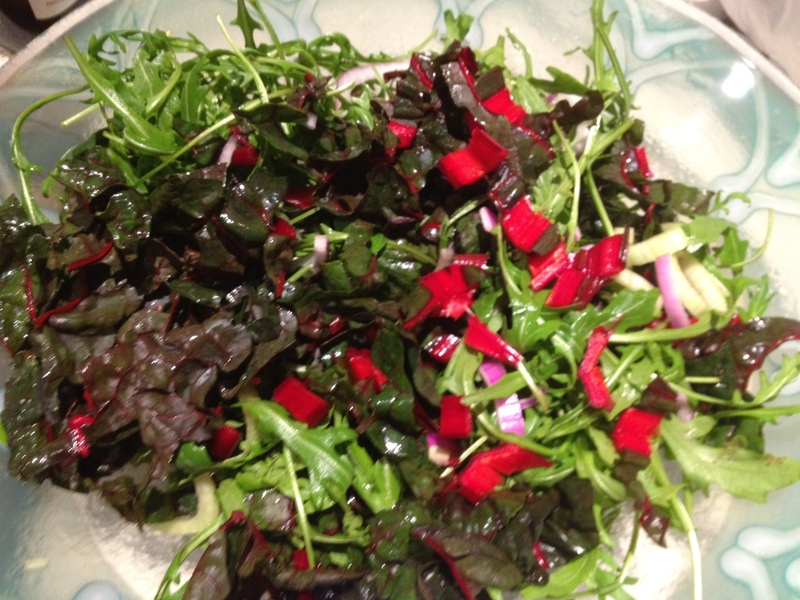 Now chop your chard, cutting the stalks into small pieces and roughly shredding the leaves. Add these in and toss well with your hands to combine the ingredients. Isn’t this chard the most heavenly colour! 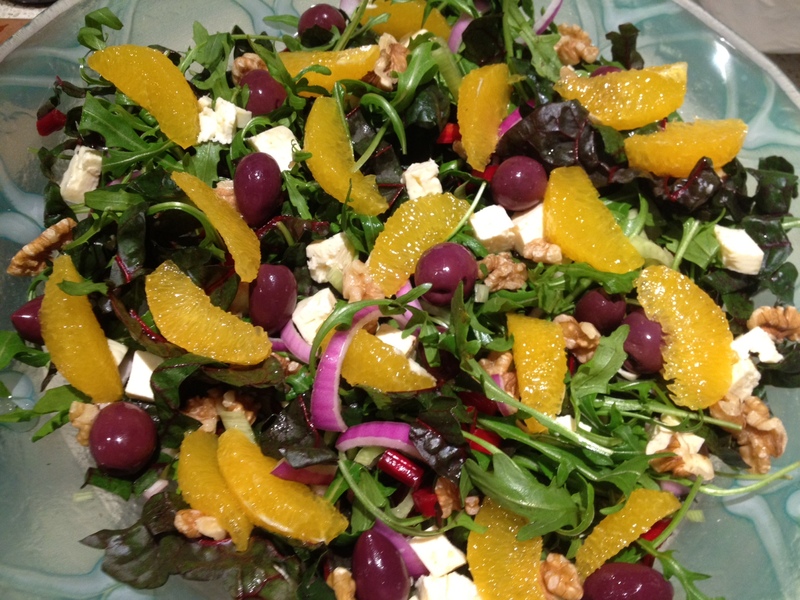 Arrange your orange segments, walnuts and olives on the top of the salad. If you’re using feta cheese, chuck that on too. Just before serving, pour on the dressing. 1/4 cup orange juice, 2 tablespoons balsamic vinegar, 1 tablespoon Dijon-style prepared mustard, 1 to 2 teaspoons honey, a grind or two of cracked pepper and a pinch of salt. Put all the ingredients in a small jar, add lid and shake vigorously to combine. This is an oil-free dressing that is light and flavorsome. Add cooked, sliced chicken breast for a complete meal. Sliced cooked lamb fillet is wonderful for a warm salad. Substitute cherry tomatoes for feta, and add fresh peeled prawns (shrimp) – this is one of my favourite salads! When I’m tired, or busy writing and don’t want to take too long away from the flow of words, I turn to miso soup. I can eat this stuff breakfast, lunch, dinner and all meals in between! My soup is never a hard and fast recipe – rather it’s a technique that lets you add whatever you fancy to a simple base, and… voila! You can whip up a tasty, easy meal in mere minutes. This is also a recipe that adapts well to vegan, vegetarian and gluten free. The picture above contains prawns, mushrooms and bok choi, because that’s what I had to hand. I’ll list my staples below and then give you the recipe for the soup in the picture. Basic Ingredients: Rice, udon or other fresh or dried noodles. (I like rice noodles for the gluten-freeness of them all! 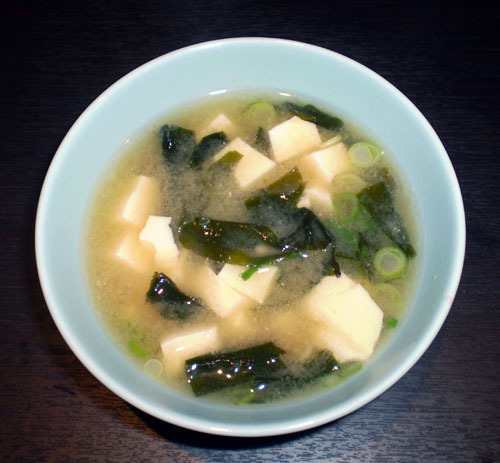 ), water, miso paste – there are many types of miso, white is good if you are a miso novice, but choose the one you like the most, fresh ginger – finely chopped or grated, soy sauce or Bragg Liquid Aminos, kombu or other dried seaweed (optional). To make your soup, follow the directions below, no matter what your choice of ingredients. 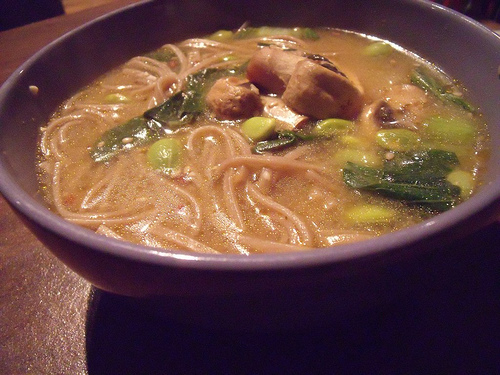 This one (below) has noodles, mushrooms, broad beans and left-over drunken chicken at the base (under all the noodles!). I also made a vegan one that night, replacing the chicken with baked pumpkin pieces. 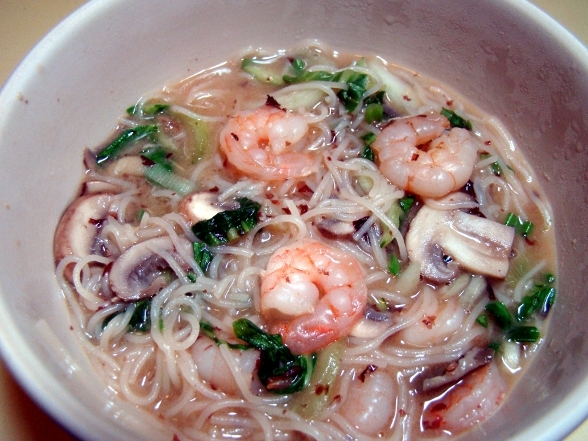 Easy Prawn Noodle Miso Soup: (this serves four people as a starter or two hungry people as a main) Get your ingredients ready. Clean and de-vein your prawns. Have enough for about 1/2 a cup per person as a starter or 3/4 to one cup as a main. With big prawns this may be just two or three for a starter. Finely grate about a tablespoon of raw ginger. Allow about a cup of vegetables and enough noodles for half a serving bowl per person. I used swiss brown mushrooms and bok choi, sliced, and also a few shallots (green onions) from my garden. Keep your vegetables in little seperate piles if the cooking time will vary. If you are using another protein source have it chopped into small cubes or chunks. Keep all raw animal based-ingredients on their own chopping board, and wash knife and board well before cutting vegetables or tofu. Cut all vegetables into small pieces, and finely chop any herbs you are going to add. Prepare your noodles. If they are dried cook in boiling water until done, drain well and add to serving bowls. If they are fresh you can heat them in the miso broth. Place one litre of water in a large saucepan. Add about 3 tablespoons of miso paste (you can add more later to taste if required). Stir and bring slowly to the boil. Add in the ginger and about 2 tablespoons of soy sauce or Braggs Liquid Aminos, and a tablespoon or so of dried seaweed. Dump in fresh noodles if they need to be heated. Give them a minute or two in the broth and then add your prawns or other uncooked animal protein. Wait a minute and add your vegetables and/or tofu. Don’t add the herbs/shallots yet. Heat until vegetables are wilted. It only takes a minute or so. Remove from heat. Adjust seasoning. Add a splash of sesame oil and some chilli flakes if you like things spicy. Ladle into bowls and add any herbs to the top. Eat. This pic is a snack I made recently without noodles – just wakame seaweed, silken tofu and shallots in the standard miso broth. Mmmmm…..
I’m a miso soup junkie! 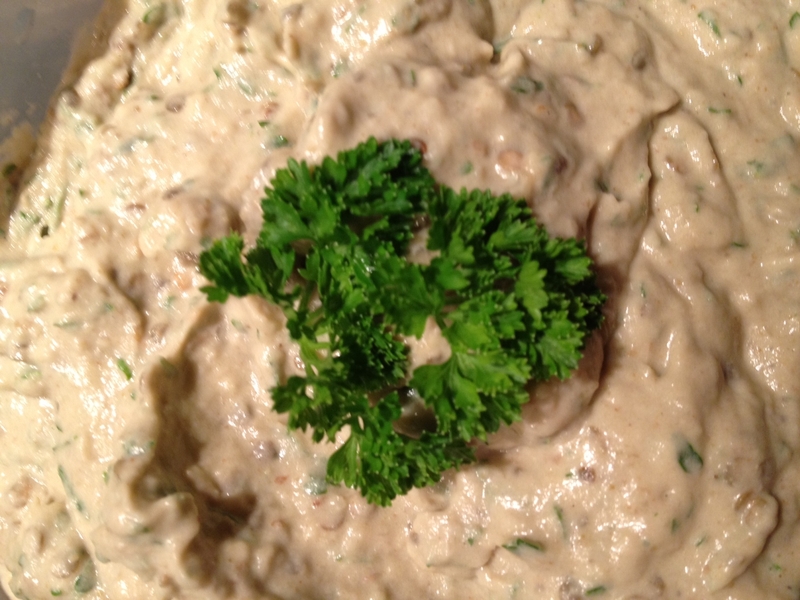 Baba Ganoush Dip Recipe – Easy! One of the things I love about living on a farm is being able to walk out into the garden, take a few ingredients, and turn them into fresh fast food. 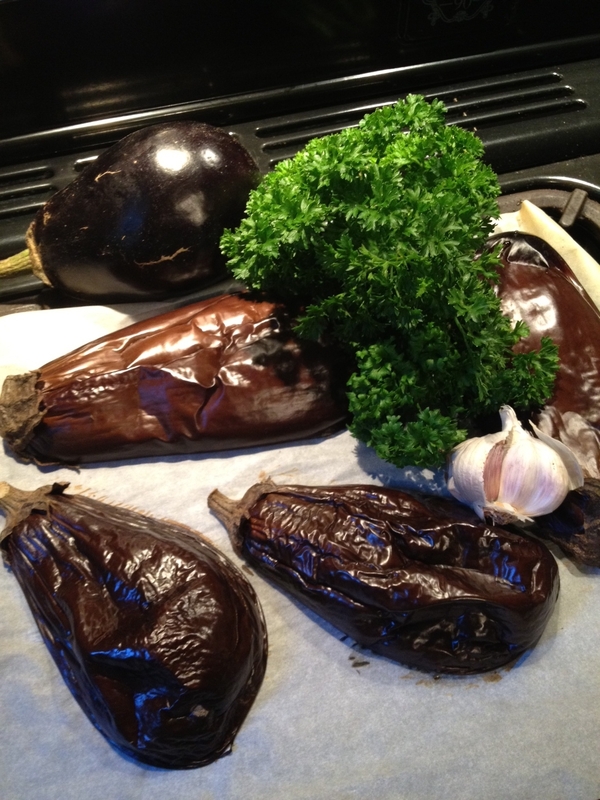 Today I’m making Baba Ganoush – a garlicky middle eastern eggplant dip, from today’s harvest. There is an eggplant bush hidden at the back of my compost area. It must have sprung up from some withered seedlings that I didn’t think would make it, so I’d donated them back to the compost where this one happily took root and grew. I plucked three fat fruit from it on my morning walk. The bush lemon down by the dam is also covered in fruit, so I picked a few of those too. I love the sweetness of these lumpy looking lemons, and it’s like harvesting golden treasure as I duck the big thorns on its branches. There’s the garlic I harvested a few weeks ago still hanging up to dry near the laundry, and plenty of parsley growing by the bathroom door. With a little effort I can make some baba ganoush to enjoy this week. It’s so easy – maybe you’d like to try it too. This is a totally adjustable recipe , depending on how much you want to make, and how strong you like your flavours. Ingredients: Two big fat eggplants, or several smaller ones. Lemon ( I used the juice of one). Garlic (I used four cloves, but you may find that excessive). Parsley (about half a cup). Cumin (teaspoon). Tahini (3 tablespoons). Salt and Pepper. Drop the whole eggplant onto a grill or over a gas flame until the skin chars. You could also cut them in half and place under a hot grill for the same effect. This imparts a lovely smoky flavour. Then cut eggplant in half, if you haven’t yet, place cut side down on some baking paper on a flat tray, and pop into a moderate (180 degree) oven for about 30 minutes until the fruit is baked and soft. Let it cool a little. Scoop flesh into processor, and add some parsley and a clove of garlic. If you don’t like a lot of garlic go gently here. I’m mad on it so I bunged in 3 big cloves. Pulse until roughly combined. Add some lemon juice (start with half a lemon and adjust to taste) and a few big tablespoons of tahini. Sprinkle in a dash of salt and pepper, and a small quantity of cumin. Whizz to combine, and then taste. Add extra of anything you think it might need. 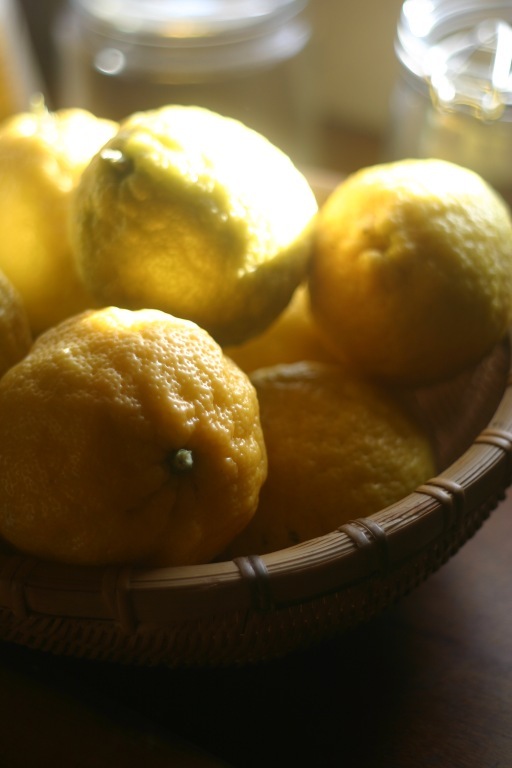 My bush lemon was quite sweet so I adjusted this with a dash of white balsalmic vinegar. Serve this with a drizzle of olive oil over it if you’re being traditional. It’s terrific with pita bread or sourdough, crackers or crudites. Enjoy! PS. 29 Jan 2012 – have just made a modified version of this, substituting macadamia paste for the tahini, coriander (cilantro) for the parsley, and adding a sprinkle of chilli flakes. Result: scrummo! I came home to my farm tonight after working in the city all week. We pushed open the gate at the bottom of the drive, meandered up the gravel road as a sunshower fell on the rich green paddocks, and I felt the weight of the world slide from my shoulders. We hadn’t been home ten minutes when I realised something – I was starving! A big call in a house with an empty fridge. I poked through the pantry. Spaghetti. But what to put with it? I figured I’d find something in the garden. Optimistically I placed a large cauldron of water on the stove, added a good measure of salt and left it to heat while I wandered up to the vegetable patch. I filled the pocket of my apron with cherry tomatoes, some basil leaves and a few sprigs of parsley, a red chilli, and then stopped at the shed on the way back down the hill for some of the new garlic and onions I harvested a few weeks ago. 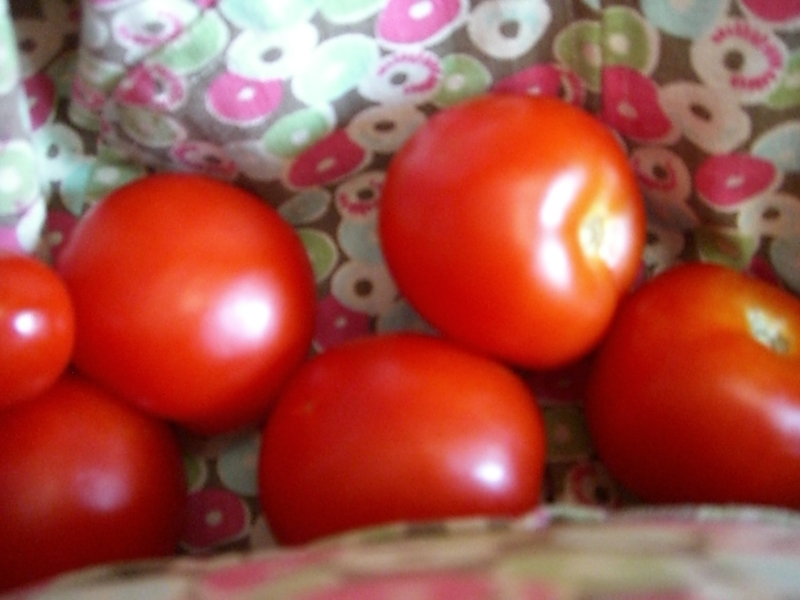 Tomatoes from the garden, held in a fold of my apron. Dumping some pasta into the boiling water, I chopped a large onion roughly, and added it to a frypan with a good slug of olive oil and a knob of butter. Then I poured myself a glass of red and allowed myself a contented sigh. While the onion softened I dug through the back of the fridge and found the last rashers of smoky home-cured organic bacon, made by a farmer friend of mine, and a heel of parmesan. I chopped the bacon and threw it in the pan, and then crushed four fat garlic cloves, slivered the chilli, and added them as well. My kitchen filled with delicious aromas. 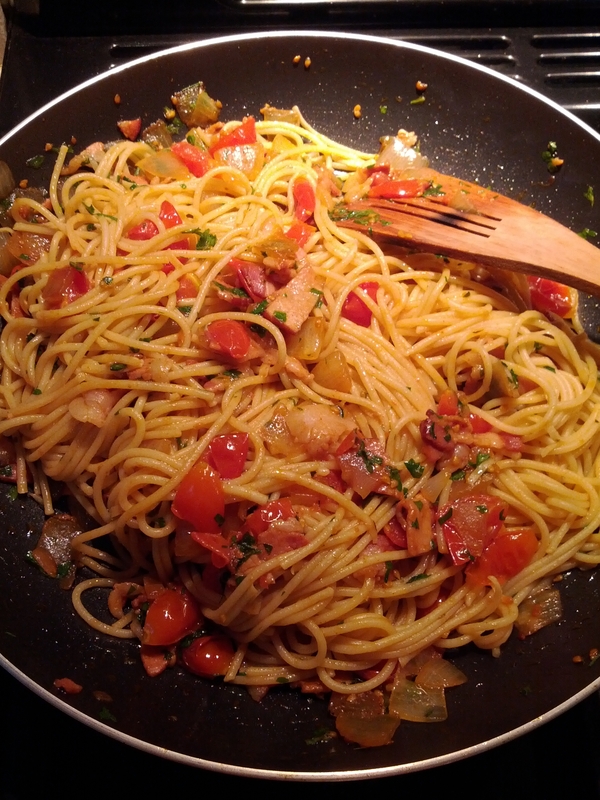 Madly I quartered the small cherry tomatoes and tossed them in, gave the pasta a stir, and then finely chopped the herbs. With the pasta cooked I drained it, added the herbs to my big frypan and then tossed the spaghetti through the sauce, ready to be dressed with a little shaved parmesan. Result: simple rustic pasta that took twelve minutes from idea to bowl. Verdict: Delicious!